In the mood for Mexican food but don’t want to eat out? 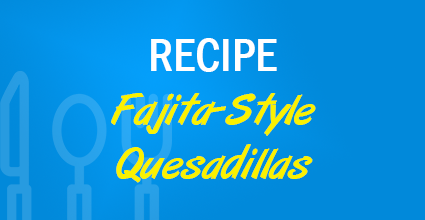 This quesadilla recipe brings you a delicious, healthy Mexican meal without going over your budget (just $0.43 per serving). For an even more authentic taste, garnish with sour cream, lime or cilantro. Add green or red pepper, onion and serrano pepper. Cook 3-5 minutes until vegetables start to become tender. Remove from heat. Spray one side of each tortilla with cooking spray. Turn two of the tortillas to the uncoated side and cover with ½ of the cheese. Cover with onion mixture, tomato slices, 1 tablespoon cilantro and the rest of the cheese. Top with remaining tortillas, coated side up. Heat a large skillet or griddle. 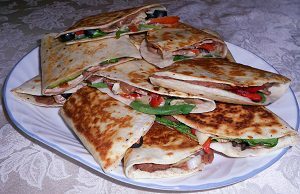 Cook quesadillas until cheese melts and tortillas are light browned (about 4-5 minutes). Cut each quesadilla into 4 wedges. Serve warm. Garnish with sour cream, lime and cilantro, if desired.